A fall in Wisconsin is as colorful as mother nature gets. Vibrant hues of red, yellow, and orange are as far as the eye can see, many pay a pretty penny to get a glimpse of the spectacle. Lucky for you, you can enjoy this annual phenomenon in style (and without breaking the bank) at any of these incredible resorts. This fall, treat yourself in the Badger state! Don’t be alarmed! Boulder Junction’s nickname- the “Musky Capital of the World”- is not referring to the town being smelly. It instead eludes to the fantastic fishing available here, and where better to spend a weekend fishing than at White Birch Village? Nowhere! With an absolutely gorgeous backdrop, a fall weekend spent at White Birch is a fall weekend spent surrounded by beauty. The lodge itself is nestled inside splendid Northern Highland State Forest, and offers a pristine lake setting for nature lovers and sport fishermen alike. The resort’s 60 acres are filled with colorful trees and hospitable staff, eager to assist in whatever way they can. Spend a day out on the lakes, fishing, swimming, or boating to your heart's content. Or go for a scenic tour of forest, simply to treat your eyes to the cornucopia of colors before you. Bluegill, largemouth bass, muskellunge, northern pike, smallmouth bass, and walleye all call Star Lake home. Star Lake reaches a maximum depth of 68 ft! ANY time of year, Baker's Sunset Bay is a prime destination in the waterpark capital of the world- come and experience it for yourself! From its gorgeous lakeside property to its spacious hotel rooms, family-sized suites, and romantic Jacuzzi suites, every aspect of Baker's Sunset Bay is superb. Spend your days out enjoying the beautiful fall colors or inside in the world-famous Wisconsin Dells! Baker’s Sunset Bay Resort is on the “quiet side” of the Dells, away from all the traffic and noise, but close enough so that a drive never feels like a chore. Whether you seek natural serenity or family waterpark fun, Baker's Sunset Bay is the resort for you! Ishnala Supper Club sells more than four tons of prime rib between Memorial Day and Labor Day. Wisconsin Dells is the mecca for waterpark/water playground properties, the highest concentration of these facilities in the world. Charming Door County welcomes travelers from across the country every fall to discover its laid-back atmosphere, unique shops, galleries, and the beautiful waters of Green Bay. From this secluded wildlife-filled location, take out a bike (there are lots of them at The Shallows), and explore the spectacular limestone bluffs of the famously scenic Horseshoe Bay Road. Make a deeper natural connection at colorful Peninsula State Park, with its miles of hiking and biking trails and sandy beaches. There's plenty of beautiful places to explore on your Wisconsin fall getaway! The Shallows Resort is only minutes from four amazing and diverse courses for your Door County fall vacation! The Shallows Resort overlooks 375 feet of colorful Green Bay shoreline. It's one of the only Door County resorts that is directly on the waterfront. It's a tremendous setting for fall boating, fishing, and relaxing in the lake breeze. The resort offers complimentary kayaks, canoes and rowboats that you can take out to experience the water up close. Make sure to enjoy a dazzling fall sunset from the resort dock! Located in the heart of buzzing downtown Lake Geneva, this Midwest marvel puts you within footsteps of the activity-filled lake and city attractions. When you're not exploring, rejuvenate onsite with a host of welcoming amenities and well-appointed rooms. Meandering along 26 miles of shoreline, Harbor Shores on Lake Geneva is teeming with fall adventures. Explore the quaint downtown shops, tee it up on nearby golf courses, or hike the Geneva Lakeshore Path. Horseback and hot air balloon rides give you a different vantage point. The distinctly different rooms all offer a unique experience and combine panoramic lake views and panoramic views to create the ultimate Lake Geneva experience. Breathe in the fresh Wisconsin air on your private balcony, grab a drink from the wet bar, and munch on complimentary breakfast each morning. Choose between sparkling lake and lush park views when you stay at this centrally located gem. You're truly in the middle of it all at Harbor Shores on Lake Geneva! Pack a family picnic and head over to Lake Geneva’s Seminary Park, which is just behind the resort's property. Gino’s East Restaurant and Bar serves up scrumptious lunch and dinner, heated pools provide the fun, and the sauna serves as the perfect place to unwind! Never fear: Pitlik’s Sand Beach Resort isn’t made out of sand. Otherwise, the variable Wisconsin weather could cause some problems! The resort is actually made of dedication, relaxation, and fun. While many resorts tend to wind down after the summer’s busy months, Pitlik’s is just getting started. Fall is a glorious time here; wood cabins dot the landscape as colorful leaves slowly fall to the ground. Here you’ll find, as they’re wont to say, “tranquility of nature, the comfort of home and pure fun.” Whether that fin is found on the beach, around a crackling campfire, or relaxing in the rustic main lodge restaurant and taproom is completely and utterly up to you. Just make sure you watch the sunset over Sand Lake; it’s a sight that you won’t soon forget! The population was 1,398 at the 2010 census. Eagle River is the county seat of Vilas County. Choose from two or three bedroom Lakeside Cabins right on the beach or three bedroom Lakeview Townhomes just a short walk from the beach, and enjoy the gorgeous fall colors at Serenity Bay Resort! From year 'round fishing to amazing golf experiences, a stay at Serenity Bay Resort is fun-filled from start to finish. After you've settled into your superbly cozy cabin, head outside and participate in any number of activities and attractions! Check out the St. Germain Biking & Hiking Trail, which runs through St. Germain and is only one paved mile from Serenity Bay Resort. Love golf? You'll love the 16 golf courses within a 20 minute drive from St. Germain. And if the weather is uncooperative, head out to enjoy the shopping in Minocqua, Eagle River, Sayner or Boulder Junction- perhaps buy a souvenir to remember a fantastic experience! Beautiful Little St. Germain Lake is one of the finest producing lakes in northern Wisconsin covering 959 acres with 15 miles of shoreline. Nearby go karts, horseback riding, wildlife parks, kayaking, canoeing and more are sure to please the family! Escape the hustle and bustle of the city life and experience fall in the cornucopia of colors of northern Wisconsin. The Beacons of Minocqua is the perfect place to spend quality time together while exploring your spectacular surroundings. At The Beacons of Minocqua you'll hike the trails, fish for bass, and enjoy a lakeside bonfire all in a day! Of course the resort's luxury accommodations ensure that you have a relaxing getaway with plenty of options available. Choose from condominiums, log cabins, or cottages featuring amenities like full kitchens/kitchenettes, fireplaces, spacious living areas, and more. An onsite sauna, pool and hot tub help you relax after a full day of activities. You can also enjoy an activities center, movie rentals and board games with your loved ones. In the midst of the natural beauty you and your family will make memories that you'll cherish for years to come! Boat rentals allow you and the family to explore the waters at any speed, including fishing boats, canoes and pontoons. There's nothing quite like a scenic fall getaway to gorgeous Waterbury Inn! Your comfy multi-bed lodging suite comes complete with a fully equipped kitchen, living and dining rooms- more than you need, but no less than you deserve! Afterwards kick your feet up and relax with the flat screen TV or free wireless internet. Or, better yet, head outside and take in the breathtaking fall colors! The absolute serenity of forested rural Wisconsin is, after all, unparalleled. Whether you're with your family or your significant other, you'll never want to leave your Waterbury condominium! Wisconsin had 5,742,713 residents as of 2013. Wisconsin is the 20th most populous state in the US. Any time of year, Door County's Landmark Resort remains a must-see destination! Whether you're alone or have the family in tow, Landmark Resort can provide a stupendous experience. Their superb hospitality is easy to find here, as are their superior accommodations. In Fall, head out into Egg Harbor for a bouquet of glorious colors, smells, and sights. Take a walk along a trail and observe nature's annual light show. There's a reason the resort has been recognized by greats like "Midwest Living" magazine- it's a Wisconsin landmark! One, two, and three bedroom suites are available, each with a choice of woodland or water views. 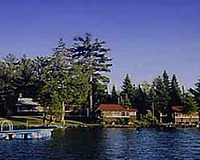 The Resort is 7.8 miles from Peninsula State Park and 10.4 miles from Baileys Harbor. Tri Lake Timbers Resort & Gardens's eight unique yet similarly luxurious cabins are just what the doctor ordered, any season of the year (fall included)! With 103 scenic acres of Iron River paradise, Tri Lake Timbers figuratively lights up during the fall! The reds, yellows, and oranges of the Chequamegon National Forest are best observed firsthand, so feel free to take a stroll through one of its many trails. Most all cabins feature gas fireplaces, cathedral ceilings, full baths and kitchens, and full-size beds in every bedroom! Whether you're out on the trail on an ATV, hitting the water with a boat rental, or relaxing in the cabin, you'll be making lifelong memories! There's a 24' 2003 Northwoods Pontoon available for guests to rent! 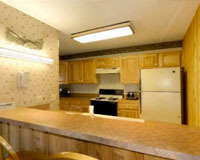 All cabins include basic bedding & pillows, kitchenware, microwaves, coffee pots, and toasters. Janetski's Big Chetac Resort has been proudly family owned and operated for over 30 years. For guests of this lakefront resort, this means family fun is around every turn. Popular Big Chetac Lake adventures include swimming, boating, and fishing. The resort's many rentals make lake trips as convenient as can be. Big Chetac has been named the "bluegill capital of Wisconsin." Complimentary kayaks, paddle-boats, and canoes are available so you can explore the waters at your leisure. After an active day, retreat to your cozy lakefront cottage where you can cook a nourishing meal and peek out the window to lovely Big Chetac. The resort features a shallow swimming area along the beach where you can play and splash around. There's a swim raft available as well for the more adventurous travelers. And if you just want to lounge on the shore and soak up the sun, that's okay too! You'll find amenities such as full kitchens and spacious rooms, and vacation necessities including great views, grills, picnic tables and campfire rings. Take your family on a fall getaway at the Blue Harbor, and you'll immediately understand why the first words you see on their official website are “It's Better At The Blue". Enter the kingdom of Blue Harbor, where you'll feel like a king or queen upon your arrival. The palace-like exterior of Blue Harbor exudes luxury and relaxation, a feeling that continues into the sizable rooms and villas. When it comes to recreation, a diverse array of options are available to you. Go swimming in the year-round indoor waterpark, play some mini-golf course, or a just take relaxing stroll on one of the many eco-friendly lakeshore trails. Just a short drive away, the town of Sheboygan offers shopping, golf, watersports and charter fishing. You’ll find it nigh impossible to cram all of that into a weekend, but you might still want to try! On Lake Michigan you can fish for Smallmouth bass, Lake trout, Largemouth bass, Bowfin, and Yellow perch! Egg Harbor, "Best Small Town" of 2011, is a combination of the past and the present. Cornerstone Suites' 100-year-old barn brings together the rustic beauty of the 19th century with the luxury of today with its four renovated private rooms. With multiple levels, vaulted ceilings and whirlpools, each suite transforms into a home-away-from-home. Relax in the "crow's nest" sitting area that overlooks Wisconsin's serene landscape or head out on a Door Country adventure. Visit vineyards for delicious wine tastings or ride through Sturgeon Bay on a scenic boat tour. 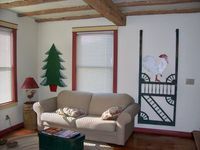 With the coziness of a B&B and the comfort of a hotel, Cornerstone Suites is your Egg Harbor destination. Located near five different state parks and surrounded on three sides by Lake Michigan, there's no shortage of ways to get out and enjoy the fall foliage. You can rent a watercraft, hop on a charter fishing trip, or try your hand at kayaking! Condos, cabins, and vacation homes- oh my! Northernaire Resort offers the best of each in the Three Lakes / Eagle River area. Nestled on the shores of the largest chain of inland lakes in the world, Northernaire Resort offers a variety of year-round accommodations and amenities sure to make your families stay a memorable one. Fall is the perfect time to come! Sit in a bubbling outdoor hot tub and enjoy the beautiful colors of the leaves, or take a hike to truly get in touch with mother nature. When you return, you'll be greeted by a luxurious lodging, ranging from studio units to three bedroom units. Whether you're with family, friends, or on an individual quest, the Northernaire is the right spot for you. Love golf? Check out Big Stone Golf Course, located across the street! 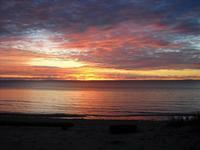 Located on the “Quiet Side” of Door County, Glidden Lodge Beach Resort is spectacular at any time of year! One of the many draws of Glidden Lodge is the incredible freedom it gives guests, whenever you happen to visit. The lake, a hive for tanning, swimming, and relaxing-by in the hot months, becomes a great place for snowshoeing and ice fishing when the temperature grows frigid. The multitude of nearby quiet roads are perfect for biking and cross country skiing. And when you're ready to return, you'll be ecstatic knowing you're returning to a spacious (and toasty) one, two, or three-bedroom condo! There are a total of 31 beautiful one, two, and three bedroom condo rentals! There's also a pool, hot tub, sauna, fitness room and tennis court! Evergreen Lodge's location, amenities, and fun will draw you in, but its the incredible hospitality that will keep you coming back. Evergreen's vintage cabins come in all sizes, for couples looking for a cozy dwelling or families trying to stretch their legs. With luxurious porches, kitchens, and inarguable charm, you'll never want to leave. But eventually you're going to go outside, and when you do you'll have so much fun you might not go back inside... ever. Fall is Boulder Junction's peak as far as natural beauty is concerned, and it's best experienced out on Little Crooked Lake with some fishing or hiking on one of the multiple nearby trails! Go take a tour of Northern Highland State Forest! A ton of different camps are also offered here! Along the serene shores of Lake Whiplash, you’ll find the charming Whiplash Lake Resort, an ideal destination for your fall Wisconsin vacation. 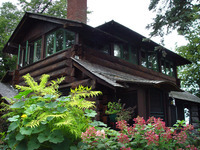 This Hayward retreat welcomes all kinds of travelers to enjoy the relaxing natural atmosphere and comfortable lodging. 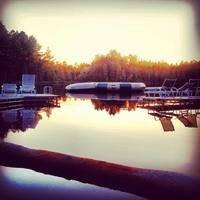 Resting on the shores of Lake Whiplash and surrounded by 500 acres of beautiful Wisconsin wilderness, the Whiplash Lake Resort is the perfect fall nature retreat. Here you can take out a complimentary kayak or canoe to explore the lake and all its colors, cast your line on a fishing trip, or explore the incredible trails on a hike. 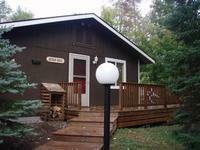 Whiplash Lake Resort offers luxurious cabins and incredible views of the beautiful Wisconsin forest color palette! Your stay includes a motorboat for lake adventures, but Whiplash Lake Resort also offers complimentary kayaks, canoes, mini-pontoons, docks, fire pits, a water trampoline, launch pad, and so much more. Nothing has been overlooked here, so you're guaranteed an exceptional vacation experience! The kids will love the onsite basketball hoop and playground! But don't forget about these cozy accommodations: fireplaces, full kitchens, fire pits and wireless internet. You'd never expect it, there's an island paradise in Wisconsin. While it might seem unbelievable, Stout’s Island Lodge is very real, and has been serving as a premier getaway resort since 1903. Island life has a certain sense of relaxation that goes with it, and a stay at Stout’s is no exception. Couples can go get a massage together, or eat an amazing dinner at Stout’s Island Club, the on-site restaurant. Families can tour the glorious fall colors while on the river in hydrobikes, combinations of bikes and paddleboats that are oodles of fun. If you’d like to get a little more active, badminton, bocce ball, canoeing, fishing, biking, tennis, and lawn jenga are all popular activities to spend an afternoon with. All this, not to mention the spacious, rustic accommodations that you’ll never want to leave! Square Rigger Lodge welcomes you to Jacksonport and scenic Door County! They'll do all they can to make sure you have a wonderful vacation, weekend getaway, or honeymoon any time of year! All Square Rigger's cottages, housekeeping units and motel rooms are conveniently located right on the shoreline of Lake Michigan, giving you easy access to the innumerable activities that come with it. Whether that means taking an evening walk on the beach or cannonballing off the dock, that's entirely up to you. Inside your accommodations you'll find superb amenities, including a refrigerator, electric heat and air, a shower and bath, T.V., free Wi-Fi, and much more! All you have to do to experience this is open the door- Door County, that is! Within a five minute walk are antique shops, a grocery store, bakery and a large town park and ball diamond. Go swimming, boating, scuba-diving, or wind surfing for wet and wild fun! Come to Lakewoods Resort, a destination with some much luxury that you’ll stop calling it fall and start calling it autumn! Lakewoods’ name doesn’t lie. Based on the shores of Lake Namakagon, the resort is surrounded by 850,000 acres of Chequamegon National Forest. The forest is beautiful in any season, but it truly shines when the leaves start to change. Take a leisurely stroll along one of the dozens of forest trails and observe how incredible the natural world can be. Then go play a round of world-class golf on the Forest Ridges Golf Course, head out on Lake Namakagon for some prime musky fishing, or just relax and enjoy the wonderful amenities available in every room. 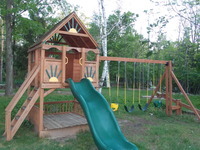 Lakewoods truly puts you and your family front and center for all the fun and relaxation that Wisconsin has to offer. Cable's population was 825 as of 2010!